Getting off a main highway has its rewards, the scenery is often better, but it also offers a glimpse into the past. While driving toward Marquette the other day I stopped by to see the town of Republic, which is off the main road, and I was able to get a look into the not to distant past of this mining region. Most the small towns in the central and western Upper Peninsula are organized around an old mine, now not in use. Some how some of these places hang on, God knows how. Republic is one of them, but the old iron miner homes are sagging, along with most buildings in town. The place, above, is an antique store that wasn't opened on the day I stopped by. 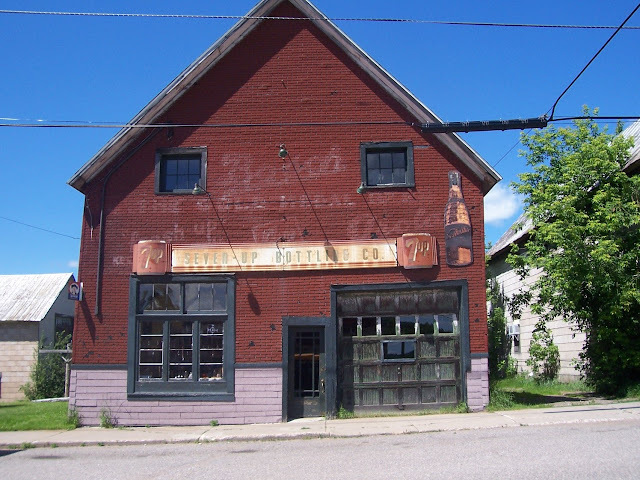 There's a faint set of lettering for Bosch beer above the doorway, which was made in Houghton/Hancock and was still sold in the 1980s. A look at the building makes me wonder what it was. There are living quarters upstairs, and a garage door in front, along with a store from. I'm stumped as to what it was. But the folks here are hanging on to the town, even though iron mining is long gone. In a way it reminds me of Detroit, which hangs on to it's rusty relics of the auto industry, even though everybody knows the good old days aren't going to come back. In 30 or 40 years, is some travel writer like me going to drive through Detroit and see it as I did Republic?